ZDDPlus Oil Additives - ZPaste Cam Lubricant - Auto Parts Canada Online Experts in the Auto Parts Industry. ZPaste™ - The Ultimate Cam Assembly Lubricant is specifically intended for the special break-in requirements of flat-lifter engines. 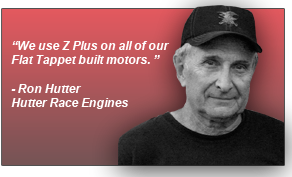 ZPaste™ is designed to be used along with ZDDPlus™ for initial engine break-in. During the break-in process it actually increases the ZDDP level of your oil as it dissolves. Not only is it the best to use for assembling a flat-tappet engine, but it works equally well on a roller setup. This is the perfect answer to the current break-in issues. Special formulation keeps ZPaste™ on contact points longer than other lubes, protecting parts from damage during initial start-up. After being dissolved in the oil, the components in ZPaste™ will continue to help protect engine parts during break-in. It took months to research, develop and test ZPaste™ against the other leading camshaft assembly lubricants. There is absolutely nothing available nationally in the market today that comes near the abilities that this cam assembly paste lubricant. The special break-in requirements of flat-tappet cam engines is best served by a specialized camshaft assembly lubricant. ZPaste™ works equally well on roller setups, along with ZDDPlus™ for break-in. ZPaste™ offers the greatest level of protection for cams, lifters and other valve components during initial startup. ZPaste™ is a proprietary formulation of Zinc Dialkyl DithioPhosphate (ZDDP) types with a Molybdenum DiSulfide (MoS2) additive in a new formulation Calcium Sulfonate base. This formulation is revolutionary, and is far superior to all other products on the market! It’s extreme adhesion allows it to remain in place on critical engine parts for long periods of time until break-in. ZPaste™ is designed to be used along with a bottle of ZDDPlus™ for initial engine break-in. During the break-in process it actually increases the ZDDP level of your oil as it dissolves. Our test results prove ZPaste™ is superior in every way to any of the major brands currently available. Our product is so good, you can literally run an engine with no oil splash onto the cam lobes for over 30 minutes, and the cam lobes and lifter feet will show no wear. We did just that in our developmental testing with a specially modified engine. You can see the actual results in our Tech Brief #12 - “ZDDP and Engine Break-in” available on our web site, along with all the other Tech Briefs and related information. It comes in a 5/8-ounce packet, which is enough for one V8 application. When used in conjunction with ZDDPlus™ (4 ounce bottle) in a normal 4-6 quart oil capacity, no special break-in oil is required. Now with the new ZPaste™ and ZDDPlus™ we have both ends of the oil issues addressed making sure protection starts at the very beginning. Remember, it’s the best assembly paste for rebuilding the valve train in an engine.